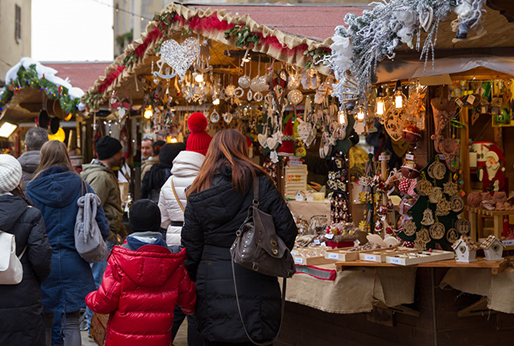 The Christmas season in Montepulciano and Tuscany begins in late November when the Christmas market opens. The season officially begins December 6th with St. Nicholas Day when the little ones hang a sock and write letters to St. Nicholas asking for the gifts they hope to receive. If they have been good throughout the last year, they will get sweets from St. Nicholas and those that are naughty get candy coal. Throughout the season numerous towns and cities host Christmas markets and festivals. Montepulciano goes a step further by hosting Babbo Natale and his helpers. This dream Castle (Montepulciano’s 13th Century Fortress) is full of lights, decorations, surprises, and children can meet the star of Christmas between games, songs, educational activities and entertainment, interactive shows, and creative workshop. Babbo Natale (Father Christmas), like Santa Clause, brings presents to children on Christmas eve. Montepulciano’s Christmas market is held in the town’s decorated Piazza Grande (which was also the background for Netflix’s Medici: Masters of Florence), and has more than 80 eighty cabins with Tuscan crafted specialties including: ornaments and Christmas decorations, food, wine and specialty drinks, chocolates and candy, clothing and leather goods, local crafts, hot tasty items, and much more. The market also hosts shows and entertainment for the whole family. The current day Italian religious Christmas celebrations are said to be started historically by Emperor Constantine who adopted Christianity and extended the holidays to January 6 (12th night) which was the day when the Three Kings reached baby Jesus. This is why the Italians exchange presents on the Epiphany. The birth of Jesus is celebrated with incredible Nativity Scene’s (Presepe) which can be found in churches squares, shops, and other public areas outside of homes. Some of the more elaborate displays go beyond the manger scene and include a representation of the entire village. Presepi are usually set up starting December 8, the Feast Day of the Immaculate Conception, through January 6, Epiphany, but some are unveiled on Christmas Eve which is when baby Jesus is added. Montepulciano dedicates an area just off the Piazza Grande to Presepes from around the world. During this period Montepulciano’s great stores, cafe’s and restaurants are open for all to enjoy.